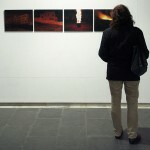 4 colour photographs on aluminium. 45×60 cm. each. Edition of 3. Four images of night time in Jerusalem, two taken in the Palestinian neighbourhood of Beit Hanina in the east of the city and two taken in the west of the city. Despite their similarities, two scenes with fire and two buildings in darkness, closer inspection highlight the conflict and underlying violence of the occupation. 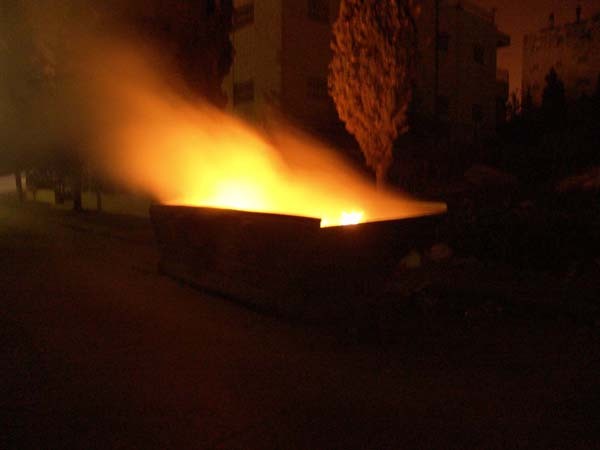 In the picture of fire, which was taken in the Palestinian zone, a burning waste bin can be seen; although Palestinians in Jerusalem pay the same municipal taxes as the Jewish residents, the city’s waste collection services never collect the waste in the eastern area. Residents there are forced to burn it. 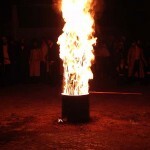 The other picture containing fire is the traditional Jewish feast of lag Ba’omer. 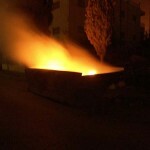 In the western neighbourhoods of the city and in the Israeli settlements bonfires are lit and people dance in circles around them. 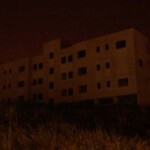 This apparent similarity may also be seen in the other two photographs, two buildings in darkness. 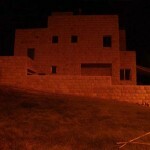 Yet one, left half-built is like a ship beached in the outskirts of the Palestinian neighbourhood of Beit Hanina. The other portrays a house in a residential area in the west of the city, just the awning on the right of the picture tells us the house is inhabited and breaks down the feeling of a phantom fort.